Call Andy Carpenter a starry-eyed idealist, but when one Geoffrey Stynes walks into his Paterson, New Jersey, law office and announces that he’s the man who cut off bent Lt. Alex Dorsey’s head, poured gasoline over his body, and set it afire, Andy (Open and Shut, 2002) refuses to represent him. In fact, since the attorney/client privilege prevents him from sharing Stynes’s revelation with the cops, he goes so far as to get himself appointed public defender to Oscar Garcia, the handyman/drug dealer who’s been arrested for the crime. It’s a resourceful, if quixotic, idea, but it doesn’t prevent ADA Dylan Campbell from dropping the charges against Garcia and arresting Laurie Collins, the Paterson cop who’d served under Dorsey, fingered him to his superiors, then quit the force after a cover-up left Dorsey untouched except for a reprimand and Laurie hanging out to dry. Since Laurie has become Andy’s investigator and lover, he takes an even more personal interest in the case. And he’ll need every scrap of motivation, because the case against Laurie seems airtight; the judge, Walter “Hatchet” Henderson, is no friend of Andy’s; Geoffrey Stynes has vanished; and every new lead Andy follows turns literally into a dead end. When Laurie makes bail, she’s able to set up housekeeping once more with Andy and a security bracelet on her ankle. But how long will their pre-honeymoon last? 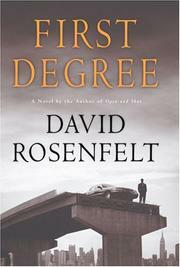 Rosenfelt’s got it all—canny invention, snappy dialogue, deftly managed legal conflicts, startling surprises—and he displays it all with an economy that should make his courtroom brethren hang their heads in shame.